OceanGate was founded to expand access to shallow and deep water environments through the next generation of manned submersible solutions. Over the past four years, OceanGate’s engineering and research team has spent considerable time and financial resources in the design, operation and construction of submersible assets for client use in subsea programs. New designs, upgrades and refits have produced three submersible assets: Antipodes, Cyclops 1 and Titan, each with unique features that help our clients achieve their mission objectives. 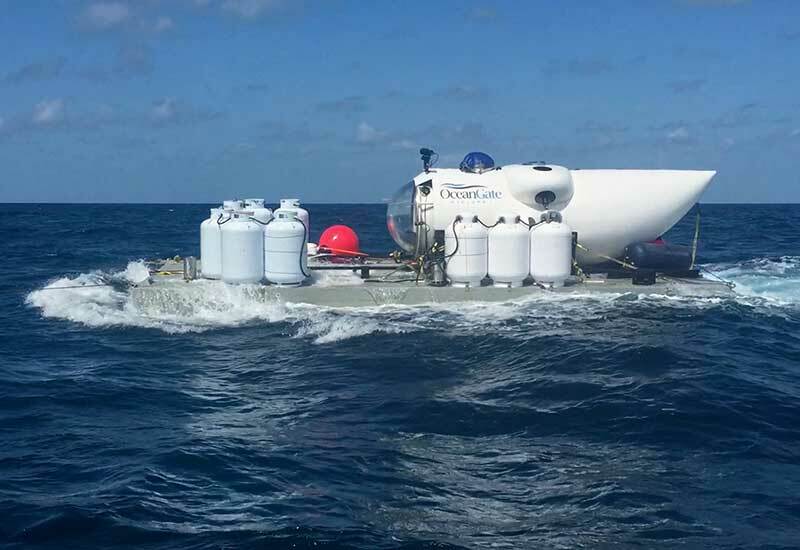 In addition to our manned submersible assets, OceanGate’s engineering team has developed a patent pending launch and recovery platform, which increases mission flexibility by providing a standalone option for deployment when ship time is limited. The platform program utilizes our engineering expertise to expand our solutions for a variety of budgets and sea states. OceanGate continues to leverage technology, materials science, control systems and engineering to deliver the next generation of tools and vehicles for shallow and deep water missions. Eyes on site: OceanGate’s manned submersible solutions permit real-time modifications to test profiles, onsite visual reconnaissance and dynamic multi stakeholder assessments. With safe, low impact to the environment, quality and cost efficient solutions, our goal is to deliver manned submersible programs that allow our clients to make better connections and informed decisions related to their deepwater missions. Developed in collaboration with the University of Washington’s Applied Physics Lab, Titan is a revolutionary new manned submersible with a depth range of 4,000 meters. Titan will usher in a new era of increased access to the deep ocean for commercial exploration and research ventures. Recently transformed into a fully functional Cyclops prototype with depth capabilities to 500 meters, the renamed Cyclops will function as a test platform for software, technology and equipment to be deployed on the 4,000-meter Cyclops 2 submersible, scheduled to commercially debut in 2017. Utilized for shallow expeditions, Antipodes is a manned submersible that enables commercial and scientific applications for researchers, scientists, filmmakers and content providers. Through this unique submersible, OceanGate clients can access underwater environments and target sites at depths of nearly 305 meters (1,000 feet). Developed in collaboration with the University of Washington’s Applied Physics Lab, the platform operates similarly to a ship dry dock, and is ideally suited to launching and recovering manned submersibles and shock sensitive equipment such as environmental sensors or electronic data collection devices.